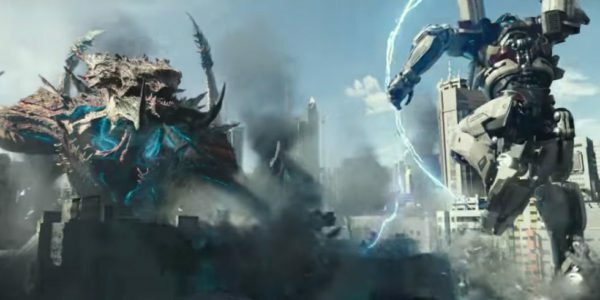 Pacific Rim Uprising lacks the magic touch of its creator, with downgraded visuals and a lower calibre of imagination but manages to preserve just enough of the original’s DNA to succeed on its own merit. SWOOSH! KLONK! ZAM! QUNCKKK! CLANK! AIEEE! VRONK! THUNK! No, this is not an itemised list of all the onomatopoeia used in the 60s Batman show (Although incidentally, every single one of those phrases has appeared in there somewhere. Even QUNCKKK!) Instead, it is a transcription of how Guillermo del Toro likely pitched his 2013 schlock epic Pacific Rim. Picture the scene; the dignified artist marching down the hallways of Legendary Entertainment, psyching himself up to wow the room with his latest idea. He walks into the production office and introduces himself to the execs, masking his nervousness beneath a cool facade of confidence. Once the pleasantries have been dispensed, he takes a seat opposite the studio heads and opens up a mysterious briefcase. For their part, the producers are all simmering in anticipation, expecting something really special. After all, del Toro is renowned for filling notebooks-upon-notebooks with his ingenious sketches and deranged scribblings. So whatever is in that briefcase, it’s gotta be good. It comes as something of a surprise then, when the esteemed auteur instead produces a heap of vintage action-figures (depicting various anime mechs and giant movie monsters) and starts gleefully mashing them together like an overgrown version of Andy from Toy Story. The revered filmmaker treats the producers to 20 minutes of this man-child lunacy, accompanying the action with his own acapella sound-effects and voices. Then, when he is finally finished, he composes himself, puts his playthings away and stares expectantly at his audience. Patiently awaiting the greenlight. And sure enough, they give him just that, along with $190 million with which he recreate this demented play-session as a major summer release. Okay, granted this is probably not how Pacific Rim truly came to be, but when you’re actually watching the movie, the above scenario feels entirely plausible. Because it doesn’t come across as a typical studio product, aimed at selling as much merchandise as possible. Rather, it feels like a particularly excitable 10-year-old (one weaned on a diet of Saturday morning cartoons and old B-Movies) was given the keys to a multi-million dollar blockbuster and just went nuts with the opportunity. There was something so sincere about the youthful exuberance behind the film, making it clear that del Toro saw it as more than just a quick paycheck. Perhaps it seemed like a brainless spectacle to everyone else, but to him it was obviously something greater. It was a chance to let his enthusiastic imagination run wild and translate his childhood fantasies onto to the big screen. Now here we are, five years, two films and a couple of Academy Awards later, and Del Toro’s baby is finally getting its long overdue sequel, in the form of Pacific Rim Uprising. The only problem is that the project has spent so long in development hell, that its creator has since absconded to other things. Which is hardly surprising, given that del Toro is a man with about a thousand ideas gestating at any given moment. Indeed, he already left The Hobbit for similar reasons. Still, given that Pacific Rim was very much his brain child, many have questioned if the franchise can feasibly survive without his nurturing influence. This concern is only exacerbated when you learn that the reigns have been handed over to Steven S. DeKnight, a man whose IMDB is curiously bereft of any cinematic offerings. How could this guy (responsible for that risible Spartacus series) possibly hope to follow in the footsteps of one of the finest filmmakers of this generation? Honestly, how could anyone? Well, to be fair to DeKnight, he actually does a pretty decent job here. Sure, he’s no del Toro and mostly provides workmanlike direction, but he is equally far removed from the likes of Michael Bay or Roland Emmerich, managing to craft impressive set-pieces without ever slipping into the monotonous and disorienting excess of, say, Transformers. It’s a credit to DeKnight that, no matter how much destruction is unfolding on-screen and no matter how many pieces he is maneuvering around, you can always keep a track of where everyone is and what they are doing. Not only are his fight scenes refreshingly coherent and well-staged, but they are also pleasingly resourceful and inventive. 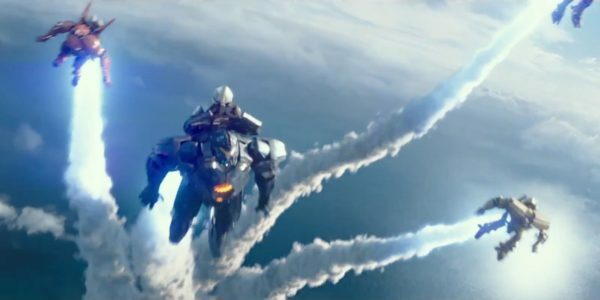 For example, there’s the introduction of the ‘’gravity sling’, a weapon this is used to great effect when a Jaeger, quite literally, pulls down a series of skyscrapers on top of an advancing monster. There’s also a fun chase scene that takes place inside one of the robots, cleverly using its internal mechanisms and compartments as a kind of obstacle course. When it’s indulging in fun gimmicks like this, Pacific Rim Uprising is a riotous blast, offering up thrills that other franchises could only dream of. Alas, whilst DeKnight seems to appreciate the ingredients of a diverting action sequence, he is less skilful when it comes to communicating the scope of proceedings. In the first film, the towering Jaegers and massive Kaijus always felt palpably immense, because del Toro used tiny details to emphasise their scale. For instance, he had oceans be displaced whenever a monster climbed onto land, the same way that water is unsettled when a person gets out of the bathtub. He also made use of thoughtful shot compositions, in order to show how the behemoths dwarfed their human counterparts and our feeble man-made structures. DeKnight on the other hand, doesn’t really have a knack for awe-inspiring visuals or dramatic presentation. Exemplifying this is the fact that, for some reason, the action is shot at Jaeger height throughout and so we never get a look at things from the ground-level. This means that, instead of feeling like giant colossi are rampaging through sprawling cities, it just looks like two normal size entities duking it out in a miniature village. As a consequence of this shortcoming, there’s nothing here to rival Godzilla’s jaw-dropping H.A.L.O jump sequence, or Cloverfield’s iconic decapitation of the statue of liberty. In short, without any kind of cinematic flair, everything in Uprising feels oddly small. The previously stunning Kaiju design is uninspired too and the promising world building from the original is largely brushed aside (bar a couple of references to the Black Market). Where the first film was bursting with intriguing lore and almost mythical imagery, this one feels far more restrained, with blander visuals and less ambition. For this reason, del Toro fans will no doubt miss the first film’s comparative artistry and breadth. Neverthless, Uprising does improve upon its predecessor in at least a couple of ways. Most surprisingly of all, the narrative has been considerably bulked up, with an interesting conflict revolving around remotely piloted Jaegers and a clever, legitimately unpredictable twist that builds upon a minor plot point from the first movie. Moreover, the characters are vastly superior this time around, with John Boyega’s Jake proving to be a much more magnetic protagonist than Charlie Hunnam’s Raleigh ever was. This is mostly down to the former’s significant charisma, as he routinely manages to save what would otherwise be excruciating comedy scenes, on the strength of his sheer likeability alone. Meanwhile, newcomer Cailee Spaeny is a charming presence who elevates a potentially annoying character into someone you can actually care about. The pair of leads play off each other well and their mentor/protege dynamic gives the film a strong emotional core. Oh and Charlie Day gets to go absolutely batshit this time, which is good news for It’s Always Sunny fans. Overall, Pacific Rim Uprising lacks the magic touch of its creator, with downgraded visuals and a lower calibre of imagination. That being said, it’s still thoroughly entertaining and manages to preserve just enough of the original’s DNA to succeed on its own merit. If you like big monster movies, this is well worth checking out. These links are affiliate links – by clicking them we will receive a small commission at no cost to you. Cosmically cynical and prone to excessive rants. Skills include proficient nitpicking, condescending to others and also typing.